I praise God for the thousands of selfless volunteers not afraid to work hard and get their hands dirty (very dirty) for the cause of Christ and for the relief and recovery of those effected by the storm. These folks came from Hilton Head SC and served with us last week, drilling holes for the pilings of one house, pouring concrete for the piers of another, working in the warehouse, and all sorts of other things – all without letting the smiles on their faces fade. Last month volunteers erected two new quonset huts to expand our volunteer sleeping capacity. We plan to move our existing hut adjacent to the two new ones and add one more. A team of “Mississippi Campers on Mission,” with funding from Mississippi Baptist Convention churches worked here all week building bathrooms in one of the huts and walkways between them all. The new facilities will add 10 showers and 10 commodes to our camp site. We, and all our future volunteers, deeply appreciate the work of these great folks. Campers on Mission is a national fellowship of Christian campers sponsored by the North American Mission Board (NAMB) of the Southern Baptist Convention. Shortly after the storm we acquired use of the flooded local elementary school gym to use as a warehouse for collecting and staging contributions and building materials for our ongoing projects and very active distribution center. The gym gave us about 8,000 square feet of storage space and we usually have it packed to capacity with goods coming in and out. We can’t thank enough the school board and the county supervisors who made these facilities possible for the good of the community. Literally thousands of people received aid and resources because we were able to utilize the building. The school board recently informed us that we need to vacate the premises for a June 1 schedule demolition to make way for the school’s reconstruction.. This news sent us scrambling for alternative storage options. Providentially, a local resident offered a parcel of land for our use, and we have begun making a transition. We plan to replace the gym with three smaller shelters, a stick built structure, a metal Quonset hut, and a big tent. Our friends from Trinity Lutheran Church in Japa Maryland planned and collected materials for a 30X60 building on the donated property. (See artist rendering above.) This 1,800 square feet of storage space will tremendously help with our warehouse needs. 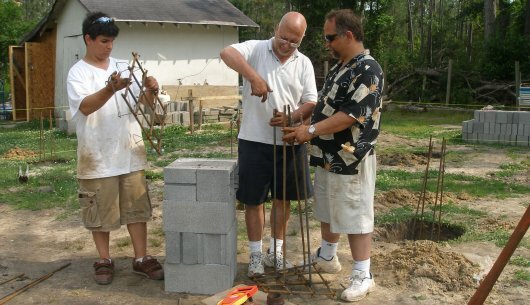 The Maryland team will construct the building on their June 11th trip. Last year a generous man in Georgia donated a 30X40 metal Quonset hut, similar to the one we use as our church facilities. We plan to erect this building adjacent to the stick built warehouse to provide an additional 1,200 square feet of space. We need to pour a slab for this building. We estimate about $2,500 for the foundation. Please contact us if you would like to contribute toward this project. Some of our good friends from Virginia donated a 40X60 tent to the relief, recovery, and rebuilding efforts in Lakeshore.. We plan to incorporate the tent into the warehouse complex to give us another 2,400 square feet under roof. Not ideal for long term use, this tent will give us breathing room while we make plans for a more permanent solution. We need to pour an asphalt pad for the tent to sit on and keep the stuff off of the wet soggy ground. If you would like to help with the asphalt for this project, please contact us. 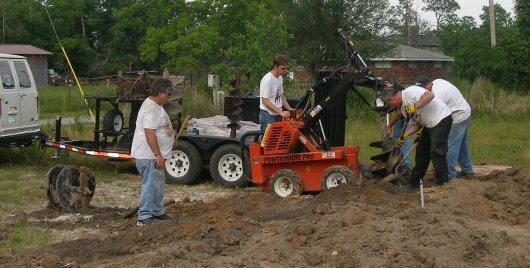 When we loose the gymnasium, we will also loose the forklift used to unload trucks and move pallets. We need a replacement. We think an all terrain forklift would work best. We would love for someone to donate or indefinitely lend some equipment for this purpose. The three planned structures, the stick built warehouse, the metal Quonset hut, and the big tent, will give us approximately 5,400 square feet to replace the 8,000 we will loose when the gymnasium comes down. Since we look to have the ongoing relief, recovery, and rebuilding in Lakeshore continue for several more years, we find ourselves praying toward a much larger building that can serve as a warehouse for the foreseeable future to meet our long term needs. The generous family providing the land for those three buildings has graciously offered enough space to rebuild a gym sized structure as well. A building that size would pose a considerable investment. Please join us as we seek god’s will in this matter. Decatur Baptist Church blessed our community with a truck load of rough cut lumber. 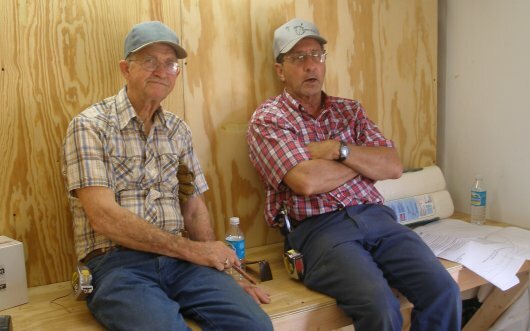 One of their members owns a portable saw mill and the men in the church took turns cutting timber donated from several places. 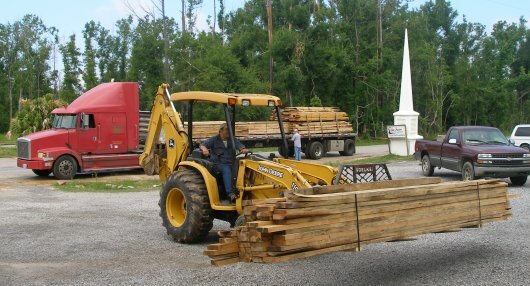 Another man volunteered his time and his rig to drive the full load of lumber from north Alabama to the gulf coast. The wood will serve in several of our rebuilding projects. In the last couple of weeks, God has blessed us with the ability to start three new houses. 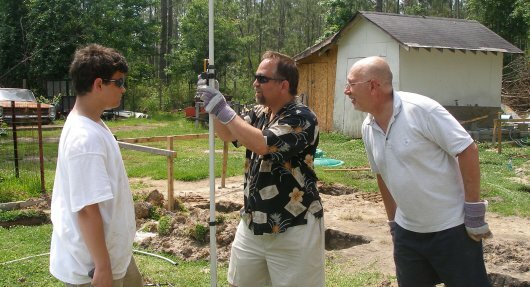 In addition to the school teacher’s house on a slab, we did the foundation work for two more. One will sit on concrete block and the other on 8X8 posts. Park Valley Church from Manassas , VA, the same folks who made the great promotional video for their trip, live blogged their experience last week. Check it out Day 1, Day 2, Day 3, Day 4, Day 5. Also, check out their Mission to Mississippi pictures. These folks were great and I really enjoyed spending time with them. 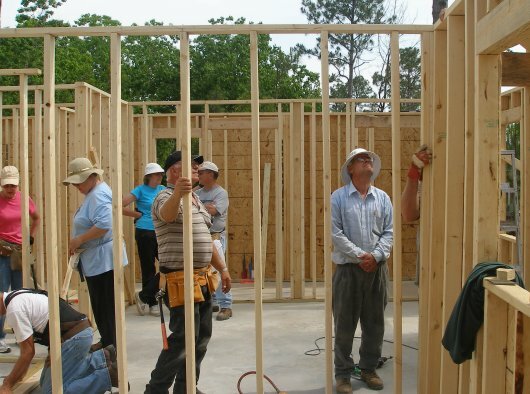 Last week a team from Southside Baptist Church in Huntsville AL, began framing up a house for a local school teacher. South Coast Community Church in Maine, the folks who made the great video I posted last week, had a mission report at their church after they returned from Lakeshore. Download and listen to their inspiring April2007MissionTripTestimonies.mp3 report. We praise God for the following teams that came to work with us in the month of April 2007. 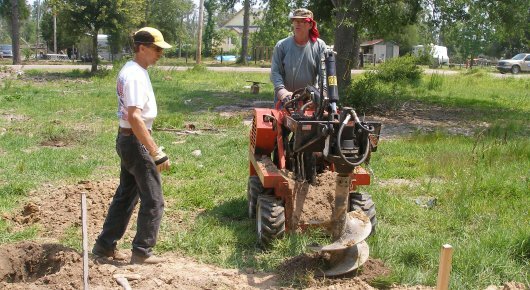 Nearly 400 volunteers glorified God through the ongoing relief, recovery, and rebuilding efforts. Mr. Howee and Mrs Juanita, Mrs. Bonnie, and Mrs PeeWee all moved into their homes this past month and dozens of families saw progress toward getting back into their houses.